Located on the famous Seminyak Beach. Puri Saron Seminyak is set amongst 2 hectares of beautifully landscaped tropical gardens and looks out to stunning views across the Indian Ocean. The hotel is located within walking distance to all that Legian and Seminyak area are famous for, excellent shopping, traditional art markets and restaurants. Seminyak ‘s wide sandy beaches and famous waves make it a heavenly place for swimming and surfing. Puri Saron Seminyak offers separate swimming pool for adult & children with beach view and world class dinning and spa facilities to cater your every need. Puri Saron Seminyak service standards ensure attention to details a welcoming and friendly atmosphere. The most suitable choice for families with children and groups, most with private balconies featuring views of the resort’s lush tropical garden. The Deluxe rooms are generously sized and located in the 3 storied buildings. Artfully decorated within modern Balinese design offering a flexible bedding configuration and some with interconnecting room facilities. Classic Balinese style cottages located in the ground floor of two-storied cottage. Nestled amongst lush tropical garden and artfully decorated with contemporary teak wood furnishings. All rooms feature private terrace with tropical garden view, bathtub and shower. The rooms are spacious with bedding configuration of one queen bed. A honeymooner’s sanctuary. Located on the top floor, facing to the beach and pool. Most of the Super Deluxe rooms are furnished with an elegant queen size bed. Every room has luxurious parquet flooring with spacious private bathroom, bathtub and separate shower area. Every room is unique, decorated in warm colors with unique pieces of furnished furniture. Large appointed room with beach and pool view, spacious sitting and lounge area with parquet tiles and wooden furnishing. The Junior Suite has luxurious bathroom facilities, a private balcony and shower. “Take a lazy dip in your own pool. Then return to the sweet doing nothing. Whatever your whim, the hotel will cater for…” Luxuriously appointed accommodations, nestled throughout lush tropical gardens. The villas are designed in modern Balinese tropical style with wooden furnishings, a spacious bedroom and bathroom, indoor bathroom. Each villa opens to its own private pool, garden and wooden terrace with sun lounger chair. Every villa has a spacious outdoor sitting and lounge area so guests can savor the balmy ocean breeze in quite privacy. 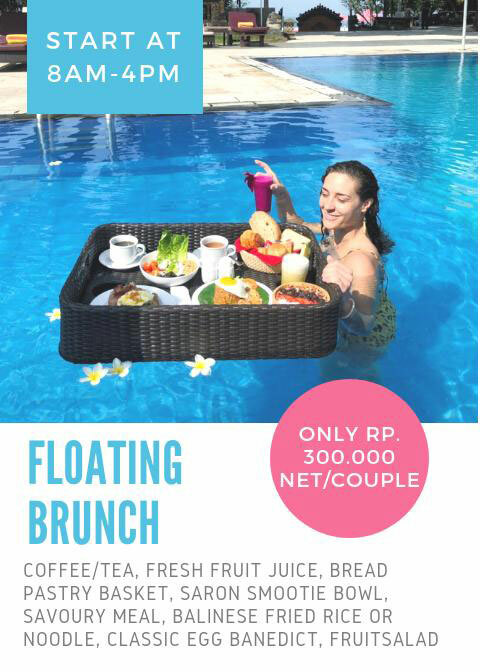 And enjoy the floating breakfast at villa’s pool. Most room with balcony/terrace, interconnecting room, standing shower ( deluxe room ), shower over the bathtub ( bungalow ), separate bathtub & standing shower ( super deluxe, junior suite, and villa ), air conditioning, satellite flat screen television, slipper, hair dryer, kimono ( villa ), baby cot ( on request ), in-room safety box, Iron and ironing board (on request), IDD telephone, mini bar, tea/coffee maker, daily housekeeping service, free WI-FI, DVD Player ( Junior Suite and Private pool villas ).